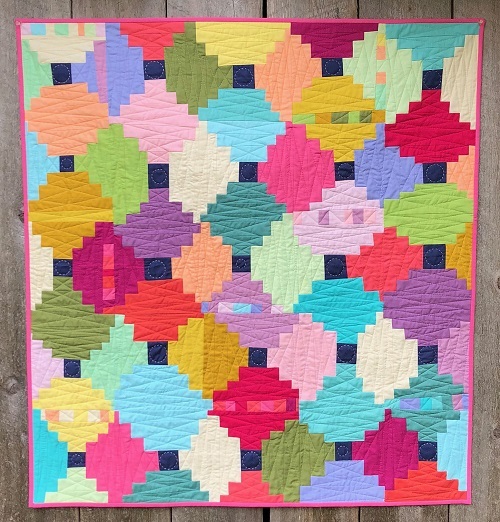 Explore the possibilities of colour expression and free-cutting without rulers while you create this wonky, nested Courthouse Step quilt (reminiscent of paper lanterns) in your own personal colour story. We’ll work intuitively from the center out, creating a dynamic quilt with loads of personality. There will be no squaring up with this one — instead Krista will show you how to “build out”, finding the fit between adjacent blocks and using up all of your scraps in the process. As in all of her workshops, Krista will share loads of tips while encouraging all students to find confidence in new techniques. Put your patchwork and rotary cutting skills to work and explore improvisational design and piecing in a fun, supportive environment. This quilt looks fantastic made with solids. There are several options for choosing your colours (you really should bring 15-20 different colours to class). Krista lists some helpful websites and other tips for fabric selection on the supply list. 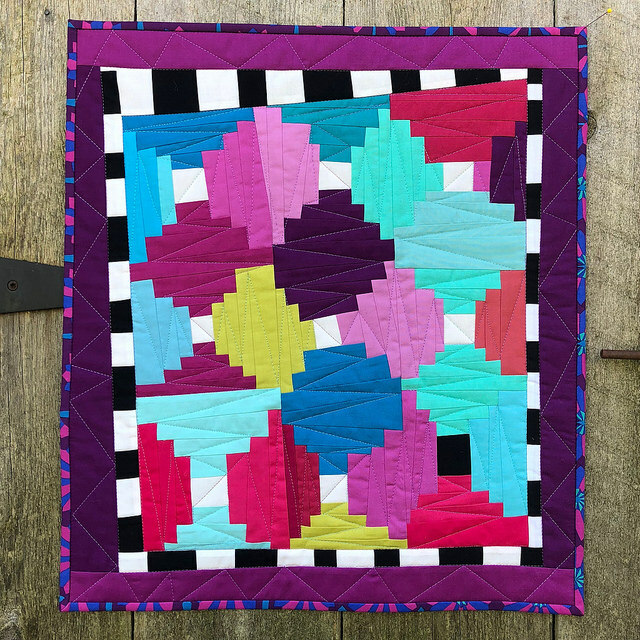 Due to the random angles and the fact that there really isn’t any background or negative space in this quilt design, patterned fabric can result in a very chaotic, confusing quilt. Really try to stick with solids, or consider tiny prints or tone on tones that read solid like grunge or grunge dots if you must. For our one day class, we are going to work within a moderate scale and stick with wallquilt/baby to lap-size quilt tops. Where: Croation Cultural Center, Vancouver, B.C. Cost:$65 for members. Sign-up will begin at March meeting. LEARN TO FUSSY CUT LIKE A NINJA! This workshop is for those who are adept at the basic skills of Foundation Paper Piecing and would like to take it up to the next level. Fussy cutting: How to place design elements exactly where you want them, even when on a weird angle. This is handy for fussy cutting an image or placing directional fabrics. Design Match-up: How to piece fabric in multiple sections and match up the fabric design to make it look like one overall piece. Handy FPP tricks include how to join sections accurately, avoiding painful unpicking. Then apply the lessons above to piece a tattoo quilt block of your choice or this 9” finished large swallow block. Note that you will need a Lightbox or an iPad with a Lightbox app, for this workshop. If you are coming with a friend you can share one between two of you. In addition you will need an Add-a-Quarter Plus (or an Add-a-Quarter ruler as well as a folding device such as a post card). More info on fabrics to bring will be sent by email closer to the day. Cost:$65 for members. Can register through PayPal Button below. Additional cost of purchasing the Swallow Pattern or a Tattoo Pattern through Berene’s website and a $2 (payable workshop day) fee for handout. Non-members: Can email workshops@vancouvermodernquiltguild.ca to be placed on a waitlist.